To develop the problem-solving skills necessary to provide comprehensive, continuous primary care services. To apply an evidence-based approach to diagnosis, treatment, and rehabilitation, as well as current principles of health promotion, disease prevention, and patient education to the management of health problems. To become proficient in the medical interview and develop the ability to make accurate and effective psychosocial assessments, interventions, and referrals for individuals and families. To function effectively in delivering comprehensive care as a member of an interdisciplinary health team. To secure needed services for patients while empowering them to be effective advocates for themselves. To promote the cultural competence and skills necessary to work with communities and defined populations in identifying problems and developing, managing, and changing health care programs and institutions to solve them. To analyze and affect the complex factors related to planning, organizing, financing, and managing health systems, including both ambulatory and hospital-based care. To understand cultural, economic, and political factors related to community power structure, decision-making, and economic development, in order to promote health. To evaluate the quality and effects of health care and to assess epidemiologic research in community-oriented primary care. To learn to teach ourselves, our patients, and our colleagues. To promote the habits and skills necessary for continuing self-education and professional development. To set career and personal goals and determine how to reach them. To understand conflicting values and to explore these within the context of cultural diversity, medical ethics, and interdisciplinary teams. To collaborate in planning of RPSM goals and objectives, and implementation, and to engage in its on-going evaluation. To provide opportunities to develop administrative, grant-writing, and advocacy skills for social change. Part of our task is to continually reassess these goals and our progress toward them. 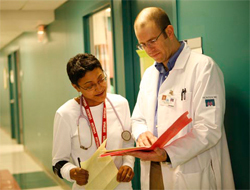 Our aim is a flexible program, suited to individual needs within certain guidelines. What each individual accomplishes and the degree of flexibility and freedom she or he may exercise depends upon individual initiative, accountability and assumption of responsibility.